MC-Islam | ISLAM---World's Greatest Religion! Terrorism is to Jihad as Adultery is to Marriage ! This is a brief overview of what Islam has to say about jihad, terrorism and the sanctity of human life. It bases itself, not on the need to please policy makers or the powers to be, nor on a colonialised mindset desperate to fit Islam into some acceptable liberal mould, but upon the texts of the Qur’an and the Sunnah, and the consensus (ijma’) and considerations of mainstream Muslim jurists. 7. One argument extremists use to justify their acts of terror is to allege that civilians living in a democracy aren’t innocent at all. Their logic runs like this: In a democracy the government represents the will of the people, therefore civilian populations are complicit in their government’s foreign policies and are thus legitimate targets in war. This allegation is as false as it is factually distorted. What this reductionist everyone’s-guilty-in-a-democracy argument ignores or overlooks is that large swathes of citizens in a democracy may not agree with their government’s foreign policies, or even have voted them into power! So how can such citizens be complicit in their government’s actions? The anti-war demonstrations and protests against the Iraq war, for instance, which scores of millions of ordinary citizens across Western Europe and the United States rallied behind, is enough to show the fallacy of such logic. Moreover, as we shall see below, the shari’ah still considers such people as not being min ahl al-qital – “actual combatants”. 3. Kashshaf al-Qina’ (Riyadh: Maktabah al-Nasr al-Hadithah, n.d.), 3:41. 5. Bukhāri, no.3015; Muslim, no.1744. 13. See: Ibn Hajr al-‘Asqalani, Fath al-Bari Sharh Sahih Bukhāri (Beirut: Dar al-Kutub al-‘ilmiyyah, 1989), 6:182. 14. As per the classical Hanbali jurist, al-Buhuti, Kashshaf al-Qina’, 3:47-8. 15. Cited in Fath al-Bari, 6:182. I am grateful to Muḥammad Nizami for pointing out this report to me. 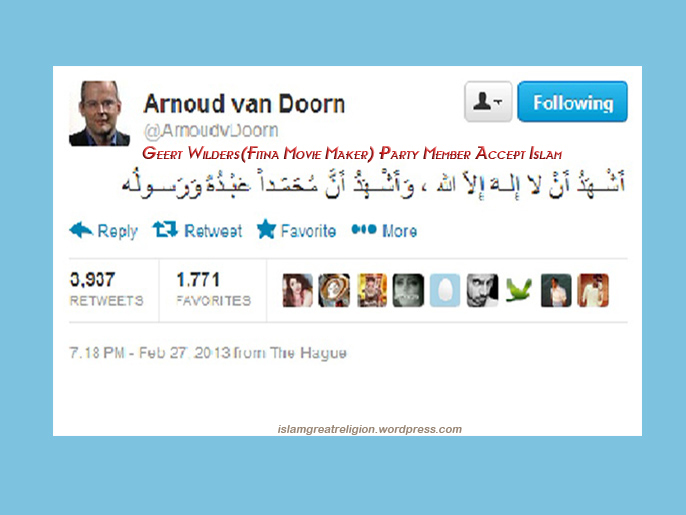 In Holland, a major islamophobic political and social activist, former member of parliament from a right-wing party, Arnoud van Doorn accepted Islam. The former islamophobe announced his decision to accept Islam on his Twitter profile. He says it is a new beginning of his life and published the declaration of Shahada (the words on monotheism to become a Muslim) in Arabic. At first, other users took the news as a joke. After all, an active supporter of a notorious Dutch hater of Islam, Wilders, has repeatedly approved islamophobic statements and public actions, and personally participated in them. 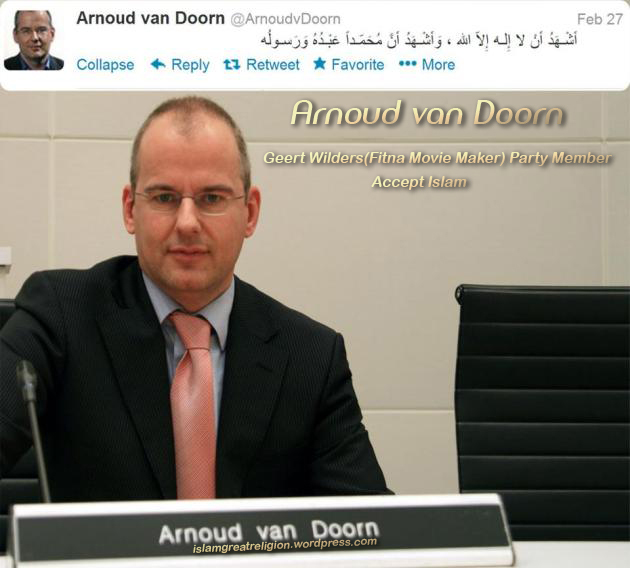 But van Doorn, who now serves as a regional adviser at the City Hall in The Hague, personally confirmed his decision to practice Islam in an official letter to the city Mayor. “We wish brother Arnoud a good new life as a Muslim and a lot of strength with the acquisition of knowledge”, the website says. Al Jazeera: What would you say to the people who are sceptic towards your conversion into the Islam? Van Doorn: I can understand that people are sceptic, especially since it is unexpected for many of them. In my own close circle people have known that I have been actively researching the Koran, Hadith, Sunnah and other writings for almost a year now. In addition, I have had numerous conversations with Muslims about the religion. This is a very big decision, which I have not taken lightly. Van Doorn: I have heard many negative stories about the Islam, but I am not a person who follows opinions of others without doing my own research and forming my own opinion. Therefore, I have actually started to deepen my knowledge of the Islam out of curiosity. My colleague Aboe Khoulani from the City Council in The Hague has brought me further into contact with the as-Soennah mosque, which has guided me even further. There, I have been received very warmly and very positively. 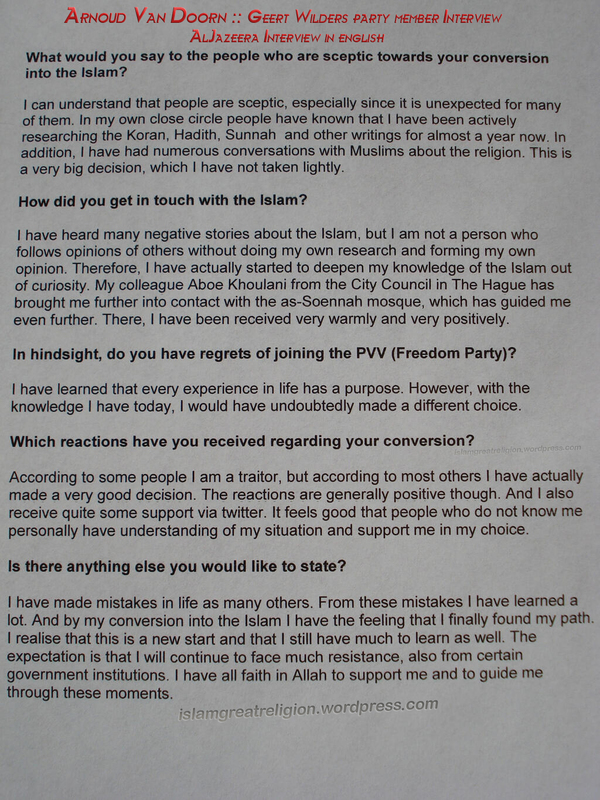 Al Jazeera: In hindsight, do you have regrets of joining the PVV (Freedom Party)? Van Doorn: I have learned that every experience in life has a purpose. However, with the knowledge I have today, I would have undoubtedly made a different choice. Al Jazeera: Which reactions have you received regarding your conversion? Van Doorn: According to some people I am a traitor, but according to most others I have actually made a very good decision. The reactions are generally positive though. And I also receive quite some support via twitter. It feels good that people who do not know me personally have understanding of my situation and support me in my choice. Al Jazeera: Is there anything else you would like to state? Van Doorn: I have made mistakes in life as many others. From these mistakes I have learned a lot. And by my conversion into the Islam I have the feeling that I finally found my path. I realize that this is a new start and that I still have much to learn as well. The expectation is that I will continue to face much resistance, also from certain government institutions. I have all faith in Allah to support me and to guide me through these moments.